Not only can synthetic molecules mimic the structures of their biological models, they can also take on their functions and may even successfully compete with them, as an artificial DNA sequence designed by Ludwig-Maximilians-Universitaet (LMU) in Munich chemist Ivan Huc now shows. Chemist Ivan Huc finds the inspiration for his work in the molecular principles that underlie biological systems. As the leader of a research group devoted to biomimetic supramolecular chemistry, he creates 'unnatural' molecules with defined, predetermined shapes that closely resemble the major biological polymers, proteins and DNA, found in cells. The backbones of these molecules are referred to as 'foldamers' because, like origami patterns, they adopt predictable shapes and can be easily modified in various ways. 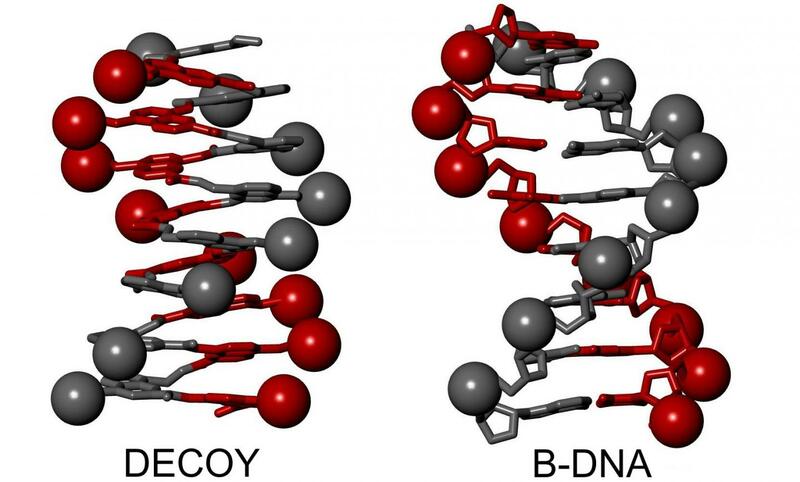 Having moved to LMU from his previous position at Bordeaux University last summer, Huc has now succeeded in synthesizing a helical molecule that mimics surface features of the DNA double helix so closely that bona fide DNA-binding proteins interact with it. This work is described in a paper that has just appeared in Nature Chemistry (1). The new study shows that the synthetic compound is capable of inhibiting the activities of several DNA-processing enzymes, including the 'integrase' used by the Human Immunodeficiency Virus (HIV) to insert its genome into that of its host cell. The successful demonstration of the efficacy of the synthetic DNA mimic might lead to a new approach to the treatment of AIDS and other retroviral diseases. The new paper builds on advances described in two previous publications in Nature Chemistry already published this year. In the first of these papers, Huc and his colleagues developed a pattern of binding interactions required to enable synthetic molecules to assume stable forms similar to the helical backbones of proteins. In the second, they worked out the conditions required to allow their synthetic helix to be appended to natural proteins during synthesis by cellular ribosomes. "As always in biology, shape determines function," he explains. In the new study, he introduces a synthetic molecule which folds into a helical structure that mimics surface features of the DNA double helix, and whose precise shape can be altered in a modular fashion by the attachment of various substituents. This enables the experimenter to imitate in detail the shape of natural DNA double helix, in particular the position of negative charges. The imitation is so convincing that it acts as a decoy for two DNA-binding enzymes, including the HIV integrase, which readily bind to it and are essentially inactivated. However, the crucial question is whether or not the foldamer can effectively compete for the enzymes in the presence of their normal DNA substrate. "If the enzymes still bind to the foldamer under competitive conditions, then the mimic must be a better binder than the natural DNA itself," Huc says. And indeed, the study demonstrates that the HIV integrase binds more strongly to the foldamer than to natural DNA. "Furthermore, although initially designed to resemble DNA, the foldamer owes its most useful and valuable properties to the features that differentiate it from DNA," Huc points out. Thanks to the modular nature of foldamer design, the structures of these artificial DNA mimics can be readily altered, which enables a broad range of variants to be produced using the same basic platform. In the current study, Huc and his colleagues have focused on enzymes that are generically capable of binding to DNA, irrespective of its base sequence. However, it may also be possible to use the foldamer approach to develop DNA mimics that can block the action of the many important DNA-binding proteins whose functions depend on the recognition of specific nucleotide sequences.